What is Return On Science? Return On Science is a national research commercialisation programme that leads the establishment of best practise to deliver new research to market from universities, research institutions, and private companies. Our services include connecting science, technology and project teams with strategic management, top-tier advice and guidance, world leading best practice process, and efficient access to capital. Return On Science is a foundation partner in the government’s Commercialisation Partner Network, a programme designed to increase commercial outcomes from publicly-funded research. Return On Science provides facilitated access to best in class commercialisation resources, networks and expertise to directly increase the quantum and quality of the commercial opportunities arising from New Zealand research effort. The four Return On Science Investment Committees represent centuries of combined domain specific knowledge and experience from around the globe. Made up of academic and industry experts alongside commercial and investment experts, the committees can provide tailored recommendations on market viability, research and product development direction, and connections to relevant individuals and companies. In addition to valuable advice, the Investment Committees can provide access to capital needed to progress a project. Either through approving investment from the devolved PreSeed Accelerator Fund, through recommendations to MBIE for approval of non-devolved PreSeed Accelerator Fund spending, or through connections to investors and investor groups Return On Science is engaged with. Return On Science Investment Committees are available at any stage to review progress and provide additional advice and guidance to help direct the team to the earliest development of a minimal viable product, and connections to the best international people able to provide market analysis and later, market validation. Researchers and academics can present and discuss their research with an independent committee specialised in their area. These are external members to their institution who will discuss with the researcher the merits of their project without institutional considerations. The result is much needed, unbiased and unclouded recommendations on the commercial viability, directions and steps needed for the researcher’s project. Tech Transfer Offices and Commercialisation Managers can utilise Return On Science in multiple different ways. 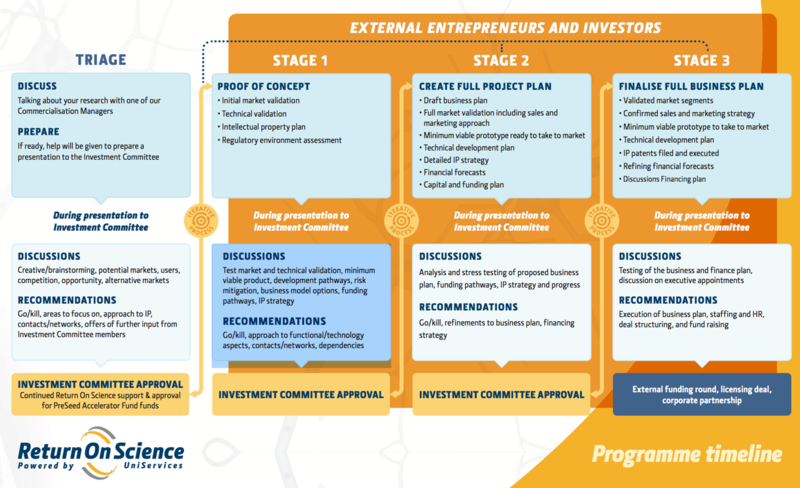 Bringing projects to the Investment Committee at the earliest stages to receive advice on the technology and potential market, and recommendations on whether the project is worth pursuing commercially will decrease the risk involved in progressing projects while positively increasing principle investigator and Tech Transfer Office dialogue. Commercialisation Managers with projects at any stage will benefit from the advice, direction and connections the Committee can give, in addition to PreSeed Accelerator funding approvals and follow on investment connections. By nature, startups generally have a very strong technical focus, but their chances of success are lifted when equal attention is paid to commercialisation activities early on. Return On Science offers its services to assist in navigating the commercial pathway. Return On Science provides investors with early visibility of a deep pipeline of technologies being developed in research organisations throughout New Zealand. Access to the Investment Committee meetings enables investors to gain an understanding of the technology and it’s potential applications. For entrepreneurs attendance means the opportunity to find and be involved with interesting technologies, and network with potential investors that have a strong interest in early stage technologies. To unlock the innovation potential of Māori knowledge, resources and people to assist New Zealanders to create a better future. Contributing to Economic Growth through Distinctive R&D. New Zealand needs its businesses and for-profit enterprises to perform at an optimum level and contribute to economic growth. This theme concerns the development of distinctive products, processes, systems and services from Māori knowledge, resources and people. Of particular interest are products that may be distinctive in the international marketplace. Achieving Environmental Sustainability through Iwi and Hapü Relationships with land and sea. Like all communities, Māori communities aspire to live in sustainable communities dwelling in healthy environments. Much general environmental research is relevant to Māori. Distinctive environmental research arising in Māori communities relates to the expression of iwi and hapū knowledge, culture and experience – including kaitiakitanga – in New Zealand land and seascapes. Improving Health and Social Wellbeing. Distinctive challenges to Māori health and social wellbeing continue to arise within Māori communities. Research is needed to meet these on-going needs. Exploring Indigenous Knowledge and RS&T (Research, science and technology). This exploratory theme aims to develop a body of knowledge, as a contribution to RS&T, at the interface between indigenous knowledge – including mātauranga Māori – and RS&T. Return On Science supports the use te reo Māori and observance of tikanga Māori during its investment committee meetings.